The subject of augmented reality has been a hot topic in recent times. Augmented reality is where reality is enhanced by computer generated information, i.e. making additional information about the real world visible to the user. This can be achieved by displaying the information using glasses, by projecting directly onto real objects using a video projector or laser projector, or by overlaying a video image with additional information, captured using a camera. In industry the use of tablet PCs with an integrated camera has become popular. In this case the video image captured by the camera is shown on the display and “enhanced” with additional information. The accuracy of the overlay achieved here enables extremely fast and cost-effective inspection of components, tools and production facilities. In times of globalisation, flexible, mobile control and monitoring of processes is increasingly becoming a key issue, as ensuring quality across the global process chain also is, resulting in increasing costs in terms of personnel, time and travel. Recently there has been a noticeable trend of moving the necessary systems away from fixed control centres and input terminals to mobile terminals. This is where augmented reality technologies can be very useful in achieving considerable added value. They enable direct, intuitive access to information and fast variance inspection, as the information is available where it is needed. Processes can also be supported continuously and without media disruption throughout the entire process chain. This can be illustrated very well in tool making, for example. 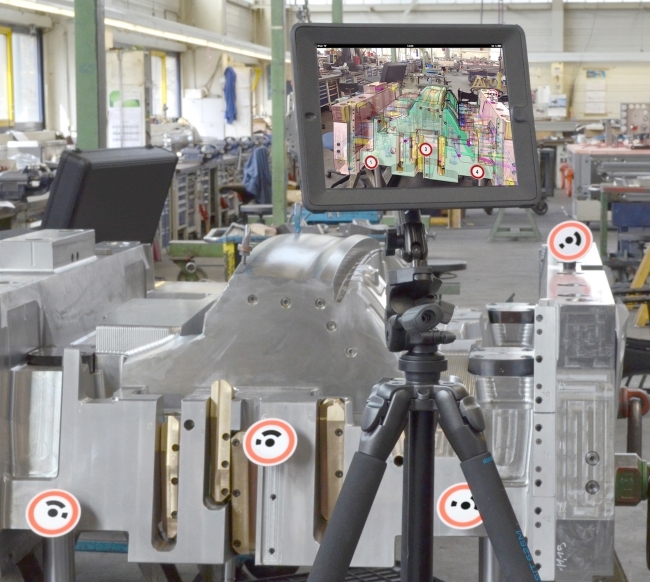 With the product “Visual Inspect AR”, FARO has found a way to use augmented reality “out-of-the-box” and to apply augmented reality effectively in a practical setting and with a variety of additional possibilities. Often polystyrene models for the casting of the raw cast items and the milled raw cast items are prepared by suppliers and only fitted by the OEM or the tool maker. The monitoring of incoming and outgoing goods usually takes place by means of specially created drawings or simple checklists, which have to be laboriously compiled. FARO Visual Inspect AR enables CAD models to be accurately overlaid onto the video image. This enables a direct comparison of the component with the plan data to be made and any discrepancies can be recognised instantly. These discrepancies can be documented in the program instantly using photo or video evidence, with the documentation or error report being linked directly to the corresponding geometry. After checks have been made, these reports can be exported as a document “at the push of a button” or transferred straight to the relevant PLM or PDM systems. Post-processing the results of the checks, for example by manually entering them into systems or laboriously creating PowerPoint presentations, is no longer necessary. As an additional feature these checks can be carried out with the guidance of checklists or step-by-step instructions, which provides additional security. As well as purely the geometry, the inspector also has all other necessary information on the device, such as metadata, ISO standards, core data, etc., so no other medium is needed for the inspection process. This all makes it possible to carry out incoming goods inspections more quickly and easily than ever before. The same applies for a brief inspection after machining. 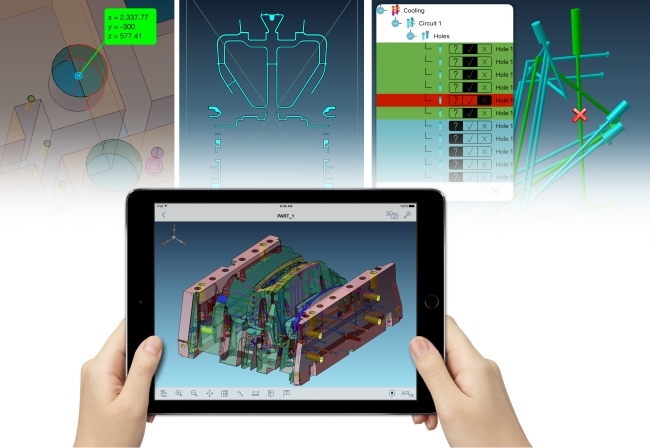 If features such as holes or slots have been forgotten when creating the CAM program, this can be checked against the construction data within minutes. It is no longer necessary to re-clamp and set up the part being processed, which quickly saves a few hours. The use of this technology also opens up new possibilities in the fitting of sub-assemblies and again helps to save time and money and to avoid errors. Components can be identified directly at the site of installation, their installation position identified and sub-assemblies checked. The creation of 2D documents for the workshop and movements between stationary terminals can also be avoided. In the area of maintenance, all documents are quickly available to the fitter on-site, and installation sites can be identified quickly using the AR overlay. As all additional information is linked directly to the 3D geometry, this data is accessed simply by tapping a finger at the point on the video image giving the user access to the necessary parameters. As design is almost always carried out in 3D these days, the additional creation of 2D drawings for production is not necessary, which again reduces costs significantly. The mobile use of the system removes the need for movement between fixed terminals, while significantly fewer systems and licenses for software are needed, as the existing ones can be used more flexibly. An additional benefit that goes along with the use of Visual Inspect AR is that faster intermediate checks can now be made anywhere and at any time. Errors can be detected and rectified at an early stage, which again reduces costs massively. 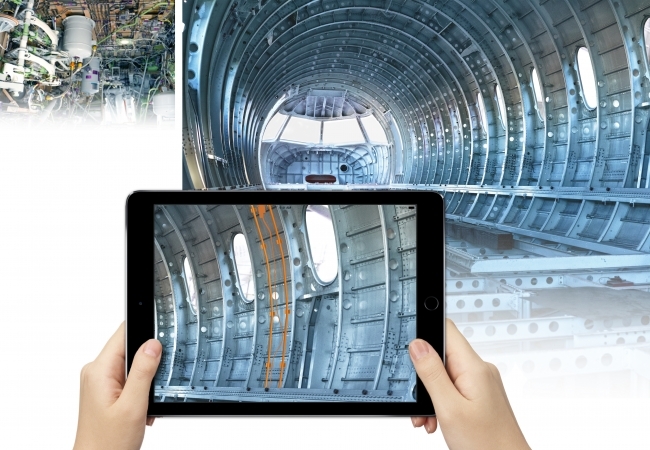 With Visual Inspect AR, FARO presents a new solution that meets the needs of global, flexible production and helps companies to make their processes more flexible, quicker and more secure, while taking into account the increasing cost pressures.